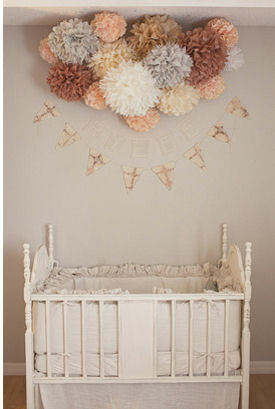 Rylee's peach and gray nursery has many playful, vintage items and custom made decorations. The gray and peach nursery that mom and artist, Kelli Murray, designed for her baby has many, many interesting features and mini-tableau's filled with one-of-a-kind items that give the room a unique and calming atmosphere and a presence that's anything but the plain, white walls that she and her husband, Sam, started with. To open the space visually she kept the walls light, painting them in soft gray, "Smooth Stone" by Glidden, which she knew would be fitting complement for the muted shade of peach that was included in the color scheme of her wedding and that now would play a huge role in her plans for the nursery. The Color Scheme for Rylee's gray and peach nursery expanded to include ivory and taupe through vintage pieces and decorations that were found on Etsy. The Nursery Furniture purchases turned out not to be the budget busters that Kelli expected. She got a big break when she found the perfect crib on Craigslist for $25. She hoped to have the same luck with finding a changing table in the classifieds but had to do a little antiquing before she found the perfect piece. The changer that she found matched the nursery dresser that she bought new at Home Goods. It was the right height and came at the right price. All it required was a coat of the same ivory paint to match it with the color of the dresser and crib. Getting the crib at a bargain left room in the decorating budget for a lovely vintage crib set AND a "splurge" piece (every mom deserves at least one! ),this Nurseryworks Empire Rocker. The foot stool with the burlap upholstery was another vintage find. The Nursery Curtains are gray, light-blocking curtains from Overstock that match nicely with the Anthropologie rug. Rylee's grandmother bought some poms as decorations for her baby shower and Kelli loved them so much that she decided to make some of her own in her colors to create a light and airy cloud over the crib over the crib. 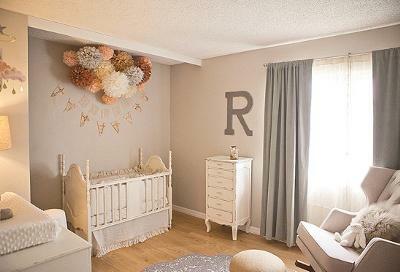 The gray and peach nursery flag bunting and the custom made, filet crochet garland with letters that spell Rylee’s name combined with the tissue paper pom poms add a variety of texture and personalize the arrangement. 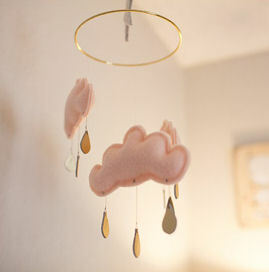 The Peach Cloud Baby Mobile is Kelli's favorite item in the nursery. Embroidery Hoops Kelli had been collecting the hoops for several years just because she loved them. 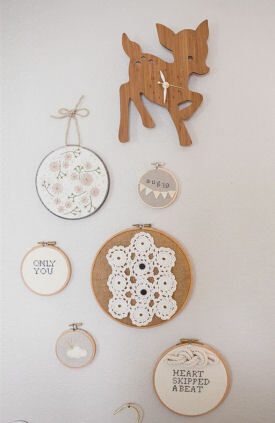 A special mini-hoop with Riley's birth date was added to the collection and the precious baby deer wall clock make a playful display. The jumper that hangs below the wall arrangement on a padded baby hanger is Kelli's favorite. To add to the airy atmosphere of the room, peach butterflies were placed to create the illusion that they are flying through the window. Thanks so much to mom, Kelli Murray and Sam for sharing their baby nursery ideas and for allowing us to feature their baby girl's nursery pictures. For shopping resources and more information about how Rylee's peach and gray baby nursery was created, visit Kelli’s blog. And while you're there, you will want to take a peek at her beautiful illustrations as well as more photos by Sarah Shreves in the gallery. 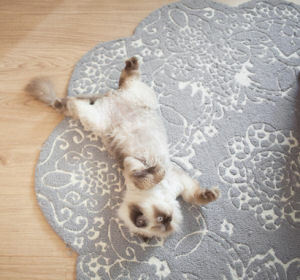 And a special thanks to their precious kitty cat for providing the perfect pose to close our feature. hi , gorgeous room!!! Do you happen to have the name of the color you painted the walls with? I love that color. And brand of paint? Such a pretty room! I love how you blended your "finds". how do you keep the pom poms from getting all dusty? The pom poms are easy to make, just search 'tissue paper pom poms' on youtube and you can watch tutorials. Hi! I've been searching for weeks for a color palette that my, soon-to-be mommy, daughter would like and I'm certain this is it! I have a bunch of questions ... PLEASE contact me :) Thanks! 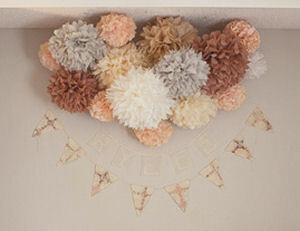 How did you make and hang those adorable pom poms?!!! Im in love!! Join in and write your own page! It's easy to do. How? 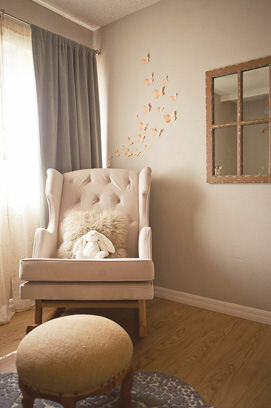 Simply click here to return to GRAY NURSERY PICTURES and DECORATING IDEAS.